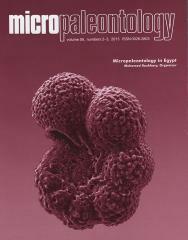 ABSTRACT: Integration between calcareous nannofossil and the planktonic foraminifera investigations of two exposed section (Gebel Duwi and Gebel Hamadat) from the Quseir area, northwestern Red Sea margin, Egypt allow to divided the calcareous nannofossil Zone NP4 into NTp6, NTp7A, NTp7B, NTp8A, NTp8B, and NTp8C subzones, which reflects continuous, well preserved, and very diverse calcareous microplankton bio-events across the Danian/Selandian boundary. The Danian/Selandian boundary is bracketed at the base of Subzone NTp8B within P3b Subzone below a level close to a sequences planktonic foraminiferal bioevents from older to younger: LO of Igorina albeari, Morozovella occulsa, M. aequa, M. acuta, M. velascoensis, and Subbotina velascoensis. Small specimens (<125ìm) of Globanomalina pseudomenardii first appear within the upper part of nannofossil NP4 Zone near the base of Selandian that differ from those previously documented. Comparison of the calcareous nannofossil and planktonic foraminiferal bio-events noted in the different paleolatitudes revealed variations in the stratigraphic range across the Danian /Selandian boundary. This variation in the timing of the first appearances of planktonic foraminifera is primarily due to taxonomically different concepts and/or climatic changes in different paleogeographic setting. Astrong drop in the relative sea-level during the late Danian associated with Neoeponides duwi benthic assemblage was identified resulting from eustatic sea level changes.